This article was co-written with Simon Reinhardt. It originally appeared at Dog City Press. This past weekend a couple of us from Dog City trekked down from Vermont to Pittsburgh, PA for the Drawing Power conference at the Carnegie Museum of Art. The museum setting established a wonderful tone for the conference. It was a breath of fresh air to go to an intimate event with such a clear focus on discussing comics. 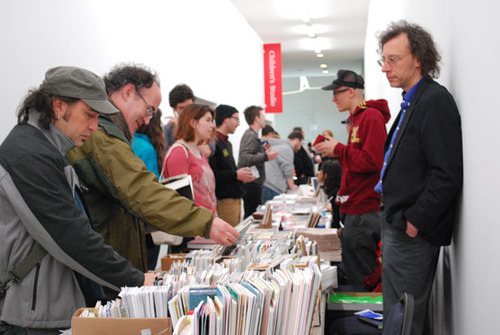 A big thanks is due to Jude Vachon, zine librarian at the Carnegie Library of Pittsburgh. Vachon was the core organizer of this event and responsible for steering it toward such a success. The days events ran from 10 AM until 5 PM. Each panel was a jam packed 45 minutes. The first panel of the day was moderated by Bill Boichel, owner of the Copacetic Comics Company. It focused on the idiosyncrasies of the local Pittsburgh comics scene. 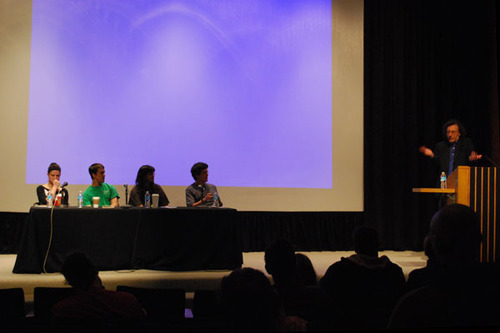 The panel consisted of Lizzee Solomon, Andy Scott, Paulette Poullet and Nate Mcdonough. The panelists spoke about their experiences self-publishing and the role that the Pittsburgh community played in their work practices. Scott spoke about his anthology, Andromeda and the restructuring of the publication in late 2012 from a monthly to a quarterly format. Solomon spoke about cartooning being at the core of her multi-disciplinary work practices while Nate McDonough retold the beginnings of hisGrixly publication. McDonough, Solomon and Scott spoke of their times drawing together during the early issues of Andromeda and the competitive one-upmanship that their drawing parties would foster. The panel explored the inroads that the four cartoonists had made into self-publishing and the external factors in their lives that had driven them to continue to self-publish in Pittsburgh. 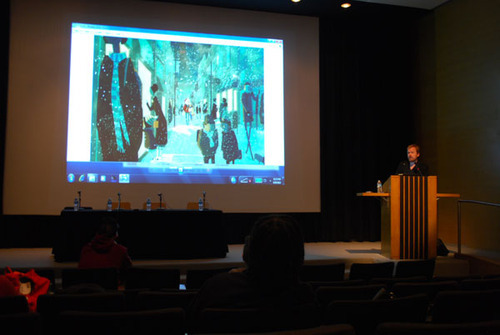 Following the Pittsburgh cartoonists panel, French cartoonist, Boulet (Gilles Roussel) , author of the 24-hour comic Darkness took the stage to give a lecture on the evolution of his cartooning practices. He spoke about streamlining his creative process and the increased emphasis on improvisation that he had developed in his work. He spoke about working with Joann Sfar and Lewis Trondheim on the series, Dungeon along with the exquisite corpse comic, Chicou Chicou, that he developed with several French cartoonists. 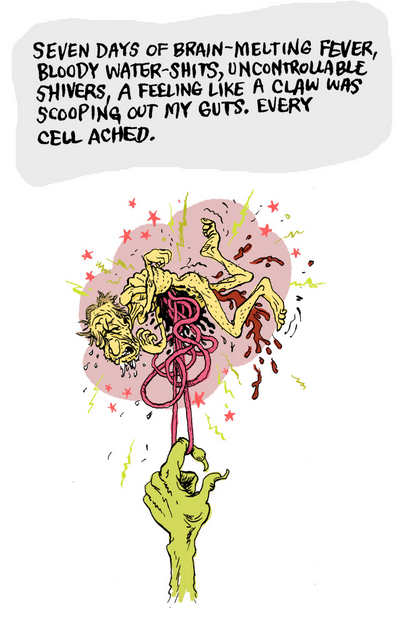 The aim of Chicou Chicou was to create a fictional “auto-bio” group comics blog. The cartoonists would pass strips back and forth over the internet adding pages until they were complete. Each of the cartoonists involved created a persona and crafted a drawing style that suited their character. Boulet played a small, geeky girl named Ella. At the end of his talk, Boulet spoke succinctly of his influences and of his current project, a 200 page improvised story in which he is neither pencilling nor scripting. He showed several of the 60 pages that he’d completed and the audience was in awe. Freelance writer, illustrator and graphic designer, Joan Reilly then took the stage and talked about her work editing the forthcoming feminist anthology, The Big Feminist But. Joan presented the book’s contents and the genesis of the project. The Big Feminist But arose from Reilly and O’Leary’s attempts to learn why so many of us, women and men, couch discussions around feminism with the phrase “I’m not a feminist, but…” or “I am a feminist, but…”. They decided to embark on the journey of making a comics anthology as the first step in starting a conversation about the issue. The result is a promising book that features “graphic musings on life, love, lust and liberation,” by talents such as Jeffrey Brown, Gabrielle Bell, and Lauren Weinstein. The book’s list of contributors is especially notable for including a number of couples working together, as well as single men and women. Reilly mentioned that a number of Kickstarter backers expressed their gratitude that men were involved with the book as well– an observation that highlights The Big Feminist But’s drive to create an expansive and inclusive conversation about feminism. Subsequently, John Porcellino, took the stage to talk about the story of his life of zine-making and distribution. He talked about the story of King Cat, and the Spit and a Half zine and comix distribution service. Porcellino touched on his artistic development and the early years of King Cat (focusing on the first 50 issues, collected in King Cat Classix). Porcellino has created books, comics, and publications since he was 7 or 8, and was creating zines for years before he discovered Factsheet 5 and learned that other people were doing it too. He read some highlights from early King Cat issues and talked about his work processes and goals in creating that work. One revelation from this portion of the talk was the influence of Marvel’s monster comics from the 50s and early 60s. While the relationship between these fantastic stories and Porcellino’s chronicles of everyday life might not be immediately apparent, Porcellino emphasized the drab, repetitive nature of the monster stories as well as the alienation of their typical mad scientist protagonists. “As an artist I’m very interested in repetition and boredom,” he said. Porcellino spoke about his interest in the idea of real life and the ineffable experience of being alive. One thing he mentioned—and we think this is a big part of what makes King Cat so special—is that he tried not just to describe the event of his experience, but to communicate the feeling of that experience. Porcellino characterized the subject matter of his comics as “this weird feeling I had… [of] the underlying mystery in every moment,” a description we think King Cat readers will agree is quite fitting. Caitlin McGurk, librarian at the Billy Ireland Cartoon Library and Museum moderated the following panel on self-publishing. Porcellino remained on stage to join Ramsey Beyer, Rachel Masilamani and Bill Boichel to chat about their experiences self-publishing in the United States. Similar to the first panel of the day, the panelists spoke of how they’d found their way to comics and more generally towards self-publishing. Masilamani recounted first encountering zines through Christina Kelly’s zine of the month column in Sassy magazine. She spoke about the experience of receiving the Xeric grant and the consequences that it brought along with it. It allowed for her to get her first comics into the world and to hit the ground running with her first collection of RPM, but from the get go she was on her own. The panelists thoughts on the pricing of mini comics were particularly interesting. Not surprisingly, Boichel as a vendor and Porcellino as a distributor had a lot to bring to the discussion of the relationship between self-expression and the commodification of desire. Boichel mentioned that artists sometimes come to him with $20 minicomics, reporting that they sold a lot of copies in New York, but he knows they won’t sell at that price point in Pittsburgh. Beyer emphasized the importance she placed on the ethics of the production process and mentioned having worked with 1984 Press in Oakland California. Boichel, suggested that aspiring cartoonists always pick someone to write to; a friend, an acquaintance, a stranger, someone. By thinking of their audience’s interests and their budget, they could be more likely to create works that would move through the world more freely. Dash Shaw followed the self-publishing panel. He began his talk by showing some recent animation work. One of the most striking animations that he played was the music video,Seraph, which he had made in collaboration with Frank Santoro and other artists for Sigur Ros’ valtari film experiment. 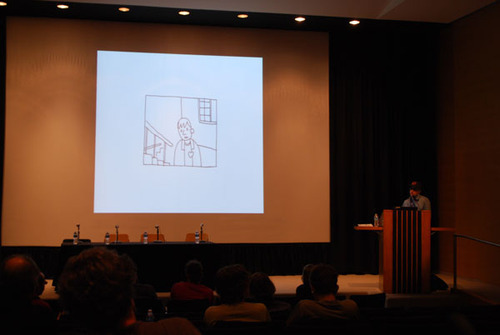 Shaw took the audience through a brief survey of his cartooning work, starting with his three current publications– the minicomic New Jobs, published by Uncivilized Books, the pamphlet3 New Stories, and the graphic novel New School, both published by Fantagraphics– and working his way backward to the mammoth graphic novel Bottomless Belly Button. One through-line of Shaw’s talk was his thoughts regarding line and color. “I could talk about color forever,” he said, and it’s hard not to get excited by his original and distinctive ideas. Many of the pages Shaw showed from New School use color in ways that are entirely divorced from traditional comic book coloring. Shaw rarely uses colors to simply fill out the drawing, preferring instead to use the collision between the color and the line-art to create meaning and emotion, often in oblique and subtle ways. This unwillingness to spell things out directly for the reader was evident in Shaw’s discussion of line and drawing as well. He spoke of being inspired by David Mazzucchelli’s idea of the “dumb line,” (which he describes in more detail here) and by trying to push back against the conventions of “good” illustration. “So much illustration is about telling people what something is and how to feel about it,” Shaw said, adding that he wanted to make drawings that don’t tell their reader how to feel. He also spoke about his fascination with the house styles found, among other places, in manga and Archie comics, speculating about an ideal, impossible Archie style. In Shaw’s conception, even the best Archie artists fall short of this Platonic style, and their own personal style would be the accumulation of their failings at achieving a true Archie drawing. All in all, it was a dense, stimulating talk, and we can’t wait to dive into New School and read it with the attention Shaw’s work demands. The final panel of the day, “A Career in Comics” was moderated by Caitlin McGurk and featured Jim Rugg, Ed Piskor, Frank Santoro and Dash Shaw. The fluidity of the discussion was really satisfying. Without much effort it hopped from discussions of style (and avoiding “style”) to explorations of narrative collapse. Of course, a highlight of the panel was the discussion of the differences between making money around comics and making money in comics. 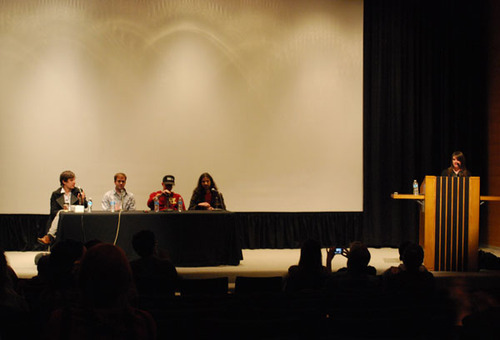 Career development and survival were recurring topics, and every member of the panel had a different way of approaching making a living as a cartoonist. The common thread was work ethic and hustle. Santoro half-jokingly described himself as “basically a used book dealer at this point.” Rugg spoke about doing design work and also discussed the Flight School fellowship , a professional development program for Pittsburgh artists he recently participated in. To see the comics medium getting the attention of an established institution like the Carnegie Library of Pittsburgh and for it to occur at the Carnegie Museum was inspiring. Here’s hoping for more small events around the country with this level of intimacy and intensity of dialogue. Gabby Schulz/(pen name: Ken Dahl) is a gifted story teller whose cartooning work is jarringly incisive. It’s a real shame that not that many people know his work. Here’s your chance to learn more. Born in Honolulu, Schulz has spent most of his adult life in transit around the continental United States. Schulz’s early work consisted of self-published mini-comics that landed him work with independent newspapers, like Honolulu Weekly. While working for these publications, he honed a nimble political cartooning vocabulary. However, as his politics moved further and further left of liberal, he found it harder to draw cartoons these publications. 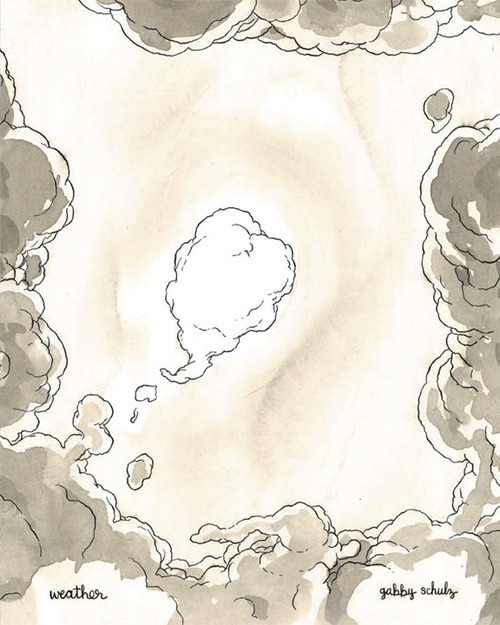 As he moved away from doing weekly political strips, he began create more emotionally charged, personal comics with a heightened political intensity. He released much of this work in his self-published books, Blind Fart (2004), Taken for A Ride (2004) and NO (2005). As he amassed a larger body of work, Microcosm Publishing; an independent publisher and distributor based in Portland; approached Schulz to publish a collection of his most poignant work. 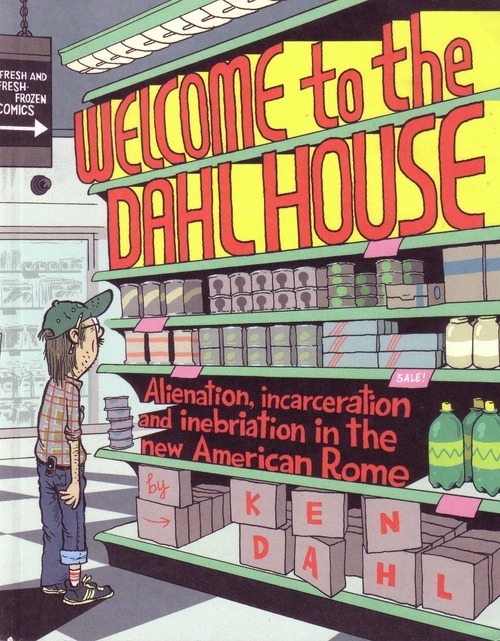 Welcome to the Dahl House : Alienation, Incarceration, and Inebriation in the new American Rome is the result of the partnership with Microcosm. It collects the comics Schulz produced between 1997-2007. The book includes stories of the humiliation and terror of airport security, the demeaning experience of being arrested, the despair ofhaving to sell off his possessions at a yard sale to pay his landlord, and more generally the horror of lost youth. It explores a painfully honest truth of the American experience in 128 pages. Rooted in the mode of 1990’s alt-weekly comics, Schulz bundles irony, bitterness and frustration into a ferocious ball of wit. 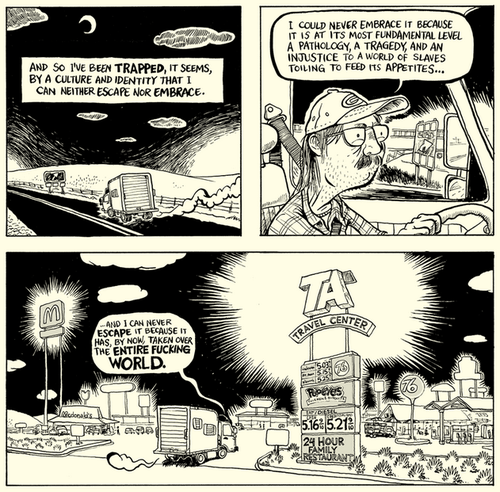 His cartooning is notable because of his light touch and snappy dialogue. His work is far more cutting than that of his politically minded; zine-making; cartooning peers. Instead of throwing gut punches to shock and awe, Schulz creates genuinely funny and sympathetic narratives. Through labor thought and effor Schulz transforms stories of anger and frustration into moving accounts of life in the 21st century. 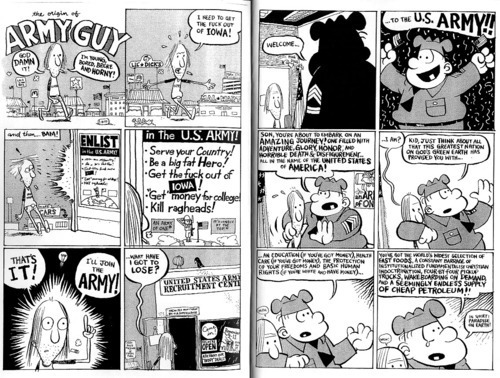 In 2007 Schulz completed a fellowship at the Center for Cartoon Studies, that same year, the first issue of Schulz’s story, Monsters, won the Ignatz award for outstanding minicomic. 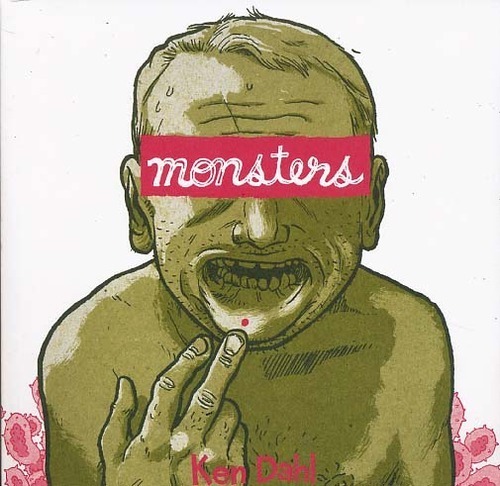 In 2009 Secret Acres published published the collected edition Monsters. .
A semi-autobiographical story about Schulz contracting Herpes, Monsters details on the physical symptoms and the traumatic emotional damage of the disease. Schulz most recent comic in print is Weather, a beautiful, hard hitting existentialist poop joke. In a story that takes place at 40,000 feet above the earth, Schulz depicts the horrors of decaying health in the United States. For those interested in reading some of Schulz’s work, much of it is available for online. A particular highlight of this work is Gordon Smalls Endures the Wasteland. It serves as a great primer for the virtuosity of Schulz’ cartooning and his capacity to digest the existential tragedy of post-industrial American society. Schulz recently put online an autobiographical story, Sick. Similar to Weather, Sick is about the horrors of getting sick without health care in the United States. Sick is a well spun yarn that serves as the record of Schulz’s own trauma. Unfortunately he has taken down Sick from his website because of the enormous amount of traffic that it generated and the ensuing problems that arose from his web hosting server. Here’s hoping it makes it to print soon. I highly recommend you hop on over to his site and pick up some copies Monsters or buy a page of original art! Louie Falcetti Interview on Bleeding Cool. Julie Sokolow recently produced a short video that explores that Billy Ireland Cartoon Library and Museum at Ohio State University. Watch the Tell Me Something I Don’t Know crew geek out over Nancy panels with librarian, Caitlin Mcgurk. Speaking of spiritual places, I’m off to go to Pittsburgh real soon. I have the first edition of my first Dailies collection. I’m damn proud of my babies. I’m looking to give them out to all the good folks that have helped me out in my cartooning endeavors and then to sell a couple. Hope folks in the ‘burgh like ’em! Over the past couple of months, while not cranking out my daily comics here at the Center for Cartoon Studies, I’ve been working hard alongside my buds, Luke Healy and Simon Reinhardt to put together a comics publication that brings together all the things that I love about comics and independent publishing. 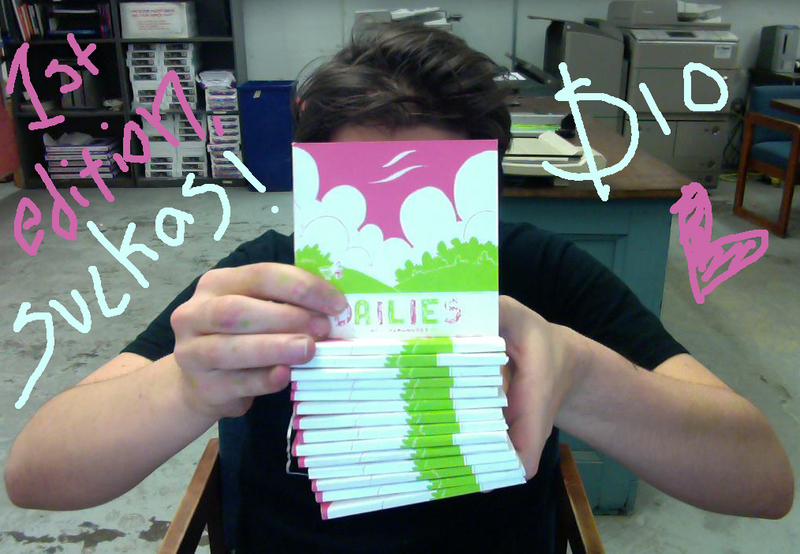 Dog City is a small press comics magazine dedicated to publishing quality minicomics. Each issue of Dog City consists of a curated selection of minicomics packaged in an artfully designed cardboard box. Issue 1 of Dog City contains over 120 pages of comics in the form of 8 mini-comics by 11 creators from around the world. The box also includes stickers, screen-printed art cards, a poster and a printed magazine about comics and comics culture. One of the books I’m most excited to be publishing is Pigs Incorporated by Iris Yan. Have a look. As you can imagine, putting something of this scale has been a bonafide labor of love. It’s been an honor to be able to service the work of my fellow cartoonists in this production capacity and to present it to the world with the respect it deserves. We’re selling this first issue for $15(+$3 for shipping). You can pre-order copies today. If you’d like to learn more about this project, hop on over to the Dog City site. There’ll be loads of posts in the coming weeks, focusing on the production process, artist spotlights and contemporary comics criticism.